Evening all!….Been messing around in my sewing space ever since I got up this morning…all that time only yielded one item though…a Butterick beauty to be exact; B5815 View C….although this pattern had just 4 pattern pieces the fabric is why it took me ALL DAMN DAY to finish it…I actually started it yesterday; I pinned the main dress pieces with only the sleeve pieces left to pin……when I got up this morning I did that and started cutting….of course the fabric is surfing all over my cutting table; I guess I should have expected it right? **the fabric has palm trees on it and looks really, really beach-y (side eye)….don’t even ask me why I’m all of sudden I’m reaching for the most annoying fabrics (the chiffons, the laces, and shantungs) that live in my stash but they have been catching my eye for the last few sewing sessions….I’m even thinking of sewing my next project in some more slinky arse fabric wtf?……I guess I like living on the edge?….the irked edge at that….for this dress I used a Maggy London 100% poly chiffon with Blueberry palm trees printed on a White background; bought from Fabric Mart…I knew all too well the fabric would get on my nerves but the print was all ‘dat so I snagged a couple yards of it….I LOVE PRINTS and my fabric stash displays my devotion…. This is my 3rd time making this pattern; I really like it…the first go ’round I used a pretty arse printed knit that I cut waaaaaayyyy too big…I botched the sleeves pretty bad too so I now wear it as a gown….the second time I made the pattern I made the top view in a super cute printed cotton…that was the BEST make using this pattern…all the different fabrics draped differently and beautifully….the top version is my favorite make with this pattern and I have yet to make the tunic version….I may not make that version though because I plan to wear this make as a tunic….all three views have the super girly tulip sleeves which I so love….I facked up the neckline twice on this dress which forced me to unpick the delicate fabric for at least an hour or so…ugggghhhhh….and after all that damn unpicking it still looked a mess when I sewed it back up….I shoulda’ did a rolled hem but I was already cussing and the rolled hem would have just added fuel to the fire…so instead I just ranted and raved a little bit and moved on….I finally finish it and the Critic (my Huny) comes in to share his opinion….His words were: “you can see right through it; I don’t know about all that but its nice though Babe”….I’ll take that as he likes it and he’ll be inspecting my outfit when I decide to wear it smh…That guy I tell ya’!…. I guess I’ll share the pictures now…Who’s been sewing with the slinkiest of slinky fabrics lately?….Do you like sewing with them? 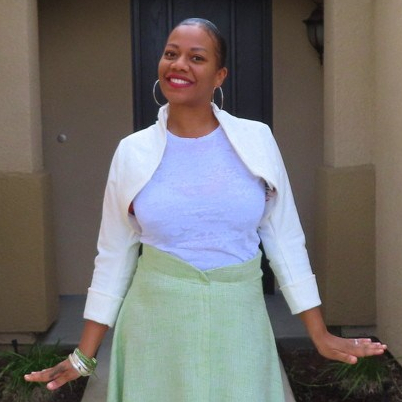 Why or why not?….My favorite fabrics to sew with are knits and cottons?…what are your favorite fabrics to work with?….Share with a Sista!…Talk to you good folks soon! Butterick B5815 View C in chiffon; in effin chiffon! oh hell no…. Pattern of the night! Butterick is all right with me! Now the Water Lily thing in the title is a little tidbit of a quote from Blanche Deveraux; as in the Golden Girls…Her and Dorothy were talking about something and Blanche was giving one of her special pieces of advice…She referred to herself as Water Lily and it cracked me up!! Especially the look on Dorothy’s face like are you serious?!? !….Hilarious I’m telling you! !…And my new top is ALL Lily….the bloom on my top is more likely a Tiger Lily; but still mighty pretty….I whipped it up using McCall’s M7195 and sewed View A….I made it before but I used a knit fabric and heavy cuffs….This go ’round I used a slinky fabric like the pattern calls for….The pattern suggested Challis, Crepe, and Charmeuse…..I don’t know what my fabric actually is although I can track the info down if anyone’s interested…I believe I still have the order slip w/ the description….the fabric came from Fabric Mart and its sold by the panel…..panel fabric always makes for something cool because there isn’t the big chore of pattern matching, just fussy cutting….I took full advantage of this fabric’s paneling with this top….I used a Burgundy rib knit for the neck and arm bands which was another of the pattern’s suggestions…..the fabric didn’t irritate too bad (I don’t really care for sewing with slinky fabrics; ironically my stash is filled with ’em) but it frayed a little…Overall it came together well…I’ll sew it again….. These pictures are kinda rough…I got tired and didn’t feel like the final press either…suppose I can work all that out when I get ready to wear it…these pictures don’t hardly show the fabric’s pretty shiny thing it has going either….I’ll take more pictures when I wear it to try to show it a little more…. Kinda bummed my weekend is coming to an end….melancholy…but happy to be able to SEW and talk about it….Sharing pictures now and I’ll talk to you good folks soon!…. Pretty top amiright!….I keep staring at it….mainly because I didn’t say any ‘cusswords while sewing it….well maybe a few…. Shot of the back….Lily goodness all over…. Evenin’ everybody!…I’m sitting here watching the telly, thumbing through my sewing magazines, and anticipating whatever fresh hell I’ll encounter tomorrow in the workplace….I’ve been sewing my little heart out ever since I got home from work Friday evening; I just freshened up and decided I may as well blog again….I’ve made some super cute stuff this weekend but this post is about the odd one….I mean to do the best I can to show my makes as I create and wear ’em…. This post is about the dress whose identity was changed in my secret sewing society….My new two piece was supposed to New Look’s View C; a dress….I’d had it cut out for at least three months but for some reason I kept getting frustrated with it….its not a particularly difficult pattern; it just gave me the blues every time I tried to put it together…I went back to it 3 or 4 times before I stashed it in my Basket of Shame (a basket that holds UFOs, half arsed muslins, and other goings on) ….I cleaned and dusted my sewing space last night and this morning got up to go through the contents of the Basket of Shame and I found my project in there waiting…some pieces were still pinned together; and to my surprise the bodice was partially completed….I had even installed the required zipper! (which I hardly ever do with such a light fabric and I don’t even remember when I did that! )….as I went through the pieces I came to the realization that I couldn’t bare to throw them in the scrap pile….I thought about it for a minute or two and went to work….I ended up with a two piece ensemble that is kinda all right if I do say so myself….I used the extra fabric for my usual sash which will probably look much better as a head wrap….the pockets didn’t bother the drape with my alteration so I kept em….I did away with the neck facings well because frankly they made the neck too heavy and awkward looking….the fabric is so light; which I didn’t know as I buy a lot of my fabric sight unseen if you will…when it gets here I inspect it and stash it away….I love every piece though…the top features those comfy kimono sleeves so this outfit turned out to be a go after all….Besides me being a pack rat I always keep my “mistake” projects….I turn em into something else sooner or later probably because I can’t stand to part with the fabric (pack rat syndrome)….I’m glad I kept this one; I free styled my arse off and came up with some good stuff….Sewing is just cool like that…..
Any body working on a project that turned into something else?….What’s on the sewing table?…UFOs and crazy looking muslins like myself?..Let me know!..I have some pictures to share and I’ll talk to you good folks soon…. My sash/head wrap…..I’m leaning more towards head wrap because I won’t have to deal with my hair when I wear this…that’s if it doesn’t look too “matchy-matchy”…. My new two piece outfit!…its hard to tell its a two piece but if you look really close you can kinda see….I didn’t know how to feel about it at first; it was giving me a 70’s kinda vibe…but now every time I look at it I like a little more….Pink Cookie is still wearing it and wearing it well…it turned out nice amiright?…..
Kinda sorta side shot….the two piece thing is more visible here…. Saturday afternoons are usually always good so I wont spend time asking if everyone is okay…you should be and if you’re not fix it!….I’m doing my usual; admiring my ever-growing fabric stash, sewing up pretties, and half-arsed watching Frasier…. **by the way does anyone know why Netflix asks if you’re still watching all the time?…I mean if I’m still paying for it then I’m still watching it amiright? **…such is life I suppose….It’s too damned HOT (its 110 degrees today smh) to go outside so I’m one of the lucky ones; you know with something beyond cool to do inside….So as soon as I got up I went to work on a new dress that I cut out last night at like one in the morning….My Huny broke my mojo all up by needing breakfast though….I went on ‘head and cooked for him but man o’ man he betta’ be glad I love him; like a lot because I was mid-sew! LOL! Now this post is to introduce my new linen beauty I finished a little while ago…I’ve been working on it all morning; I had a lot of ideas for this dress….it called for a zipper on the side but after pinning it on twice I opted to eliminate it…the fabric just wasn’t strong enough….the cool vintage zipper I was going to use was quite light too but it made the side look so jumbled up….I usually don’t use hardware on such dresses anyway unless it’s the occasional hook and eye; maybe a button or two….the pattern called for plenty 0′ gathering too….every piece called for it which made for such a pretty, girly dress….the pockets were a cool addition; cause sometimes I leave those off because of the way they make a dress hang….this go round the pockets weren’t a problem….I changed the neckline from the “V” shape to kinda rounded…the “girls” sit better with the rounded neckline hehehehehe…the pattern did have some psycho arse instructions to install the pockets which I completely ignored; mainly because there were different techniques for each pocket….oh hell no…so I just did what I do because its my damn dress and it came out just fine….no offense to the pattern because I love it and definitely have plans to sew it again…the longer version is just too lovely…..this pattern just became a member of my secret sewing society quite recently…For my birthday (it was on the 21st of this month) the Babes and I took a trip to a craft reuse (thrift store) store in Oakland, California….I was in true heaven and my inner pack rat was definitely at home…I found some fabrics and other little trinkets and this pattern was in that haul…Needless to say I was a happy camper when I left that place…. I wanna sew up a couple more things so I’ll stop rambling now and share the pictures of my new make….I need a new camera; any suggestions?…I don’t want to spend thousands of dollars; just trying to upgrade from my old school Nikon CoolPix….talk to you good people soon! I untangled the necklace before I used it for this photo; mannnnn it was in a giant knot….my boy cat is to blame…. Kimono sleeves….comfy as eva’….this is a cool pattern…first time I’ve ever sewn up a Cynthia Rowley pattern too…. Side shot of my dress!…linen has always been a favorite of mine….the wrinkles always make me happy…..
the pattern of the hour….View C is just everything….its up next when this pattern is called upon again…..
No. 5 Butterick; not margarine…..
July 25, 2016 Leave a Comment on No. 5 Butterick; not margarine…..
Now this top was the first project of my latest sewing spree…its Butterick’s B6172 View C….I used knits (y’all know I LOVE knits) but I don’t believe it called for ’em….in fact, the view would look extra purty in a slinky fabric I just know it….I’ve had these two knits for a while in my stash and put ’em together to whip up my new top….I didn’t realize the view was to have contrast but my compulsive need to buy fabric allowed me two fabrics that blended together perfectly..My stash game though; yeah buddy! ….Sewing is often just so awesome like that….Rosy color, soft red, mad cool drape, and cut outs make Butterick’s idea for this top A-1…..absolutely love how it came out and cant wait to rock it….I need more tops; I always need more tops…..this pattern I believe has at least 4 views…. Now let me share these pictures because I kinda wanna skim some of my sewing magazines for ideas….so many of them have full size patterns and I’ve never used ’em!…I must remedy that….this Vogue one is too good….Whatchall’ been making?….Direct me to the makes! Butterick’s B6172 View C in sheer knits…I believe the Rose colored knit came from Fabric Mart and the other one I got from Hancock’s….I’m STILL sad about Hancock’s….uggggghhh WTF…..
Side one; notice it only shows one layer from this side…..
Back shot of the pretty flowers…I love this fabric…I had been hoarding it of course because it was too pretty to cut…I got this pattern and thought: “Okay I guess I can cut it now”…. Toooooo pretty….hashtag sew all the knits!!!!! just in case you wanna go grab it or something similar….